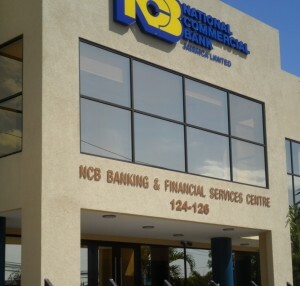 NCB stock jumped $14 on Friday partially offsetting the $17.40 fall on Thursday. 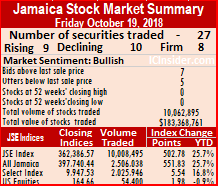 The Jamaica Stock Exchange main market closed on Friday with modest gains with 9 securities rising and 10 declining, the day after the worse fall in the market on Thursday. 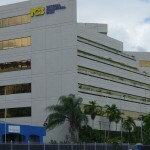 At the close, 27 securities traded, including 2 in the US dollar market, compared to 35 trading on Thursday as the All Jamaica Composite Index rose 551.83 points to 397,740.44 and the JSE Index advanced 502.78 points to close at 362,386.57. Trading ended with 10,008,495 units valued at $182,444,407 changing hands, compared with 5,646,169 units valued at $146,430,983 on Thursday. Trading closed with Wisynco Group leading with 6,729,950 units and 67 percent of the day’s volume, followed by Scotia Group trading 1,233,547 shares or 12 percent of the day’s volume and Victoria Mutual Investments with 631,604 units and 7 percent of volume traded. 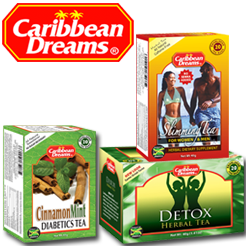 Trading resulted in an average of 400,340 units valued at over $7,297,776, in contrast to 188,206 shares valued at $4,881,033 on Thursday. 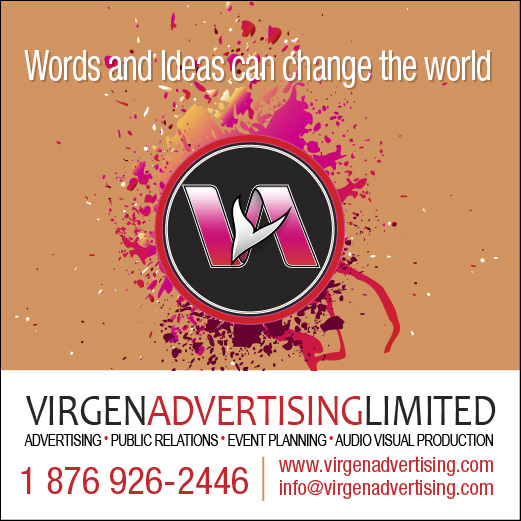 The average volume and value for the month to date amounts to 348,491 shares, valued $6,304.830 and previously 345,251 shares, valued $6,238,100. September closed, with an average of 1,022,243 shares valued $15,752,876, for each security traded. 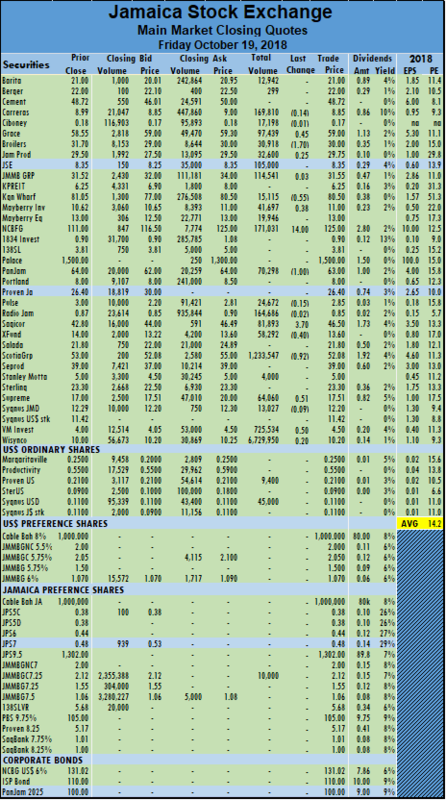 In the main market activity, Grace Kennedy rose 45 cents and ended trading of 97,439 shares at $59, Jamaica Broilers lost $1.70 in trading 30,918 stock units to close at $30, Jamaica Producers rose 25 cents to close of $29.75 with 32,600 units changing hands, Kingston Wharves fell 55 cents in exchanging 15,115 stock units, to close at $80.50, Mayberry Investments rose 38 cents to settle at $11 with 41,697 units trading, NCB Financial Group jumped $14 and ended at $125, trading 171,031 shares, PanJam Investment dropped $1 to $63 trading 24,672 shares, Sagicor Group jumped $3.70 to $46.50, trading 81,893 shares, Sagicor Real Estate Fund lost 40 cents to close at $13.60, trading 58,292 shares, Scotia Group dropped 92 cents, trading 1,233,547 units to close at $52.08, Supreme Ventures gained 51 cents to end at $17.51, with 64,060 shares changing hands and Victoria Mutual Investments rose 50 cents and concluded trading of 725,534 stock units at $4.50. 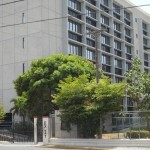 Trading in the US dollar market closed with 54,400 units valued at US$6,924 changing hands as Proven Investments ended trading 9,400 to close at 21 US cents and Sygnus Credit Investments US dollar ordinary share traded 45,000 units to end at 11 US cents. The JSE USD Equities Index rose 1.98 and closed at 164.66.